The Australian Gold Kangaroo coin, or ‘Gold Nugget’ is one of the Perth Mint’s most successful products. The coin featured a ‘gold nugget’ design from 1986 when it made its debut until 1989. Subsequent releases feature the famous red kangaroo. The Gold Kangaroo Nugget is one of just a few legal tender bullion coins to change its design each year and this, coupled with its 999.9/1000 purity and limited mintage has made it a favourite with investors and collectors. These beautifully detailed gold coins are available in a range of denominations including 1/20oz, 1/10oz, 1/4oz, 1/2oz, 2oz, 10oz and 1kg as well as the ever-popular 1oz size. With a 99.99% purity, an intricate design and discounted premiums, the Australian Kangaroo coin from the Perth Mint is one of the best bullion buys on the market. These finely detailed coins are available in different sizes and represent one of the most profitable investment options in the current economic climate. You can buy the Australian Kangeroo from the CoinInvest online store by selecting the coin of your choice then adding to your basket from the according product page. Please note that the face value denoted on the coins is in Australian dollars (AUD) and does not represent the coins true value - they are much more valuable with today's spot price. The weight in ounces represents a "troy ounce" which weighs 31.1 grams. The Australian Kangaroo is a bullion coin manufactured by the Perth Mint. It is an admirable coin that includes highest purity, top quality, high-tech manufacturing and iconic variety in design, all these qualities making it one of the most desirable gold bullion coins for investors and collectors alike. The Kangaroo series was introduced in 1986 by the Gold Corporation, a company owned by the government of Western Australia. This issue of coins introduced two unique features that gave the coins a unique marketing boost. The first feature was an ingenious "two-tone" frosted design effect, giving the motif on the surface of the coins adorable vividness and depth. Also, individual hard plastic encapsulation of each coin was highly unusual for a standard bullion coin, and it was a much appreciated extra touch. The coins are legal tender in Australia and are minted in denominations from 1/20 oz to 1 ounce, and also 2 oz, 10 oz, and 1 kg of 99.99% gold. The Kangaroo is one of the very few legal tender bullion coins to change designs every year. This combined with relatively limited annual mintage greatly affects its numismatic value even though it is a bullion coin not directly made for collectors From 1986 to 1989, the reverse of these coins pictured various Australian nuggets. With the 1989 proof edition, the design was changed to feature pictures of Kangaroos, a more world-recognized symbol of Australia, in their natural habitat. The coins are today sometimes referred to simply as "Gold Kangaroos". In 1991, 2 oz, 10 oz, and 1 kilogram sizes were introduced with the intention of using economies of scale to keep premiums low. In 1992, the face values on these extraordinarily large coins were lowered to keep them proportional to the 1 oz. coin. The reverse side design does not change annually like the lower denominations, and the same depiction of the "Red Kangaroo" is used every year. In October 2011, the Perth Mint created a one tonne gold coin, breaking the record for the biggest and most valuable coin, previously held by the Royal Canadian Mint. This giant is approximately 80 cm in diameter and 12 cm thick. It features a red kangaroo on the reverse and a portrait of Queen Elizabeth II on the obverse. The face value of the coin is AUS $1 million. The 2014, 1 oz 25th Anniversary Gold Kangaroo is the latest collectible "jewel" of the Perth Mint, featuring a leaping red kangaroo. With a maximum mintage of only 65,000 coins, the "P25" mint mark appears on the reverse, along with the inscription "AUSTRALIAN KANGAROO", the dual years 1989-2014, the weight and .9999 fine purity. The 1 troy oz Australian Nugget coin is 32.10 mm in diameter, 2.65 mm thick, weighs 1.0001 troy oz (31.10 g) and has a face value of AUS $100. The obverse bears a portrait of Queen Elizabeth II; in 1999 Ian Rank-Broadley's depiction or Her Majesty replaced the previous portrait. Inscribed we find the words "ELIZABETH II, AUSTRALIA", as well the coin's monetary denomination. The reverse has undergone changes since the coin's release. At first, this side of the coins depicted an Australian nugget. In 1989, the design changed and instead featured a more familiar motif: an iconic, engaging representation of the fascinating wildlife inhabiting Australia, the Australian kangaroo brings the Kangaroo bullion coin series to life. Here we have the inscriptions "AUSTRALIAN KANGAROO", the date of issue, the weight and .9999 fine purity. The Australian Kangaroos vary in design and are meticulously made. Established as a branch of Britain's Royal Mint in 1899, the Perth Mint's primary functions to refine gold from Western Australia's eastern goldfields and strike gold coinage continue to this day, with precious metal coins being struck onsite at the Mint, and gold refined at the Perth Mint Refinery. The standard of minting excellence for which the Perth Mint is renowned comes from its wealth of tradition and experience, matched by the latest world-class coin and manufacturing technology. Starting from the sublime artistic design, going to the engraving of the 3-D model and the meticulous production of the dies, continuing to the state-of-the-Art minting and finishing, and saving for last the protective wrapping of the delicate pure gold surfaces, Australian Kangaroos enjoy all the care and attention of the Perth Mint's unrivalled expertise that makes them valued for their high-quality finish and artistic workmanship. Today, the Perth Mint is a member of an elite group of world mints whose pure gold, silver and platinum legal tender coins are universally acknowledged and trusted for their superior quality and innovative design. The Mints' manufacturing techniques-especially as far as the making of the dies is concerned - practically makes it impossible for Australian Kangaroos to be convincingly copied. Parts of the body of the design actually overlapping parts of the frame, together with the depth of the relief, takes more than mastermind counterfeiting abilities: it also needs highly sophisticated equipment that are unlikely to be found anywhere else. 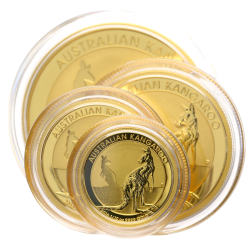 As one of the leading gold bullion dealers in Europe we are always interested in hearing from patrons who would like to sell Australian Kangaroo coins. We offer highly competitive rates to sellers so contact one of our friendly team members for a quote on your Kangeroo coins and we will prepare an evaluation based on current spot prices and confirm it via email.